Mayor Emanuel might be slowing down on some things, but he's thumbs-up on a Lincoln Elementary expansion. 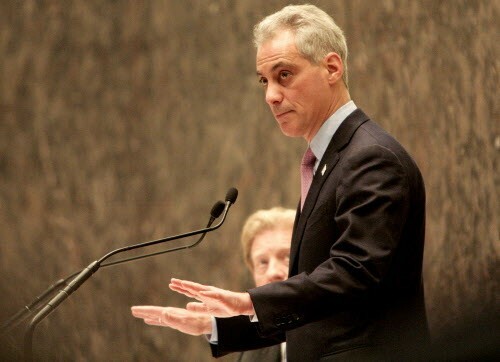 I was hoping to bring you the good news that Mayor Emanuel came to his senses and ditched his plan to waste—I mean, spend—at least $18 million to build a school annex in Lincoln Park. That's an addition that no one really needs and not even all Lincoln Parkers support. But alas, our mayor has let us down—again. At yesterday's meeting of the Public Building Commission—a body that the mayor chairs—the commissioners unanimously voted to approve the project. So now our schools are one step closer to being even broker than they already were—as if not being able to afford toilet paper wasn't broke enough. This is the plan in which the mayor pushed Lincoln Elementary—in one of the city's wealthiest neighborhoods—to the front of the line, so to speak, even though there are many more overcrowded schools on the southwest and northwest sides. And he did this even though there's a perfectly good, far less costly solution to Lincoln's overcrowding. As I've mentioned before, Lincoln's overcrowded in part because they have a gifted program—for high-testing children—and a French-language-immersion program in the building. Move these programs out of Lincoln and—voila, as the French might say—you've pretty much solved the overcrowding problem. Without spending at least 18 million preciously needed dollars building an annex. It's particularly egregious that the mayor's allowing the French school to take up space at Lincoln because it's basically a private school. It's called the Ecole Franco Americaine de Chicago—or the French American School of Chicago. And students pay $5,180 in tuition. Here's the link, in case you want to know more. Look, people, nothing against the French program. I love the French. Joakim Noah's my favorite Bull. And I really love that scene in Casablanca where everyone defies the Nazis by rising to to sing La Marseillaise, the French national anthem. C'mon, everybody together . . . But there's no compelling or logical reason to keep the French program (or the gifted-kid program) in Lincoln when there are so many other underutilized schools in the area. Especially when it's costing us $18 million to build an annex at Lincoln! This is such an obvious point that I can only feel that someone—or some people—with tremendous clout are pulling Mayor Emanuel in the opposite direction. There's certainly no shortage of clouted parents with access to the mayor's ear who send their children to Lincoln Elementary. But back to yesterday's PBC meeting . . .
Several people spoke against the proposal, including one woman who broke into tears recalling how her son learned to play baseball on the Lincoln playground. Oh, yes, I forgot to mention: on top of everything else, the mayor's building this addition on Lincoln's playground. That's called taking a bad idea and making it worse. All together now—in the words of the French national anthem . . .
Mayor Rahm shouldn't have shuttered Trumbull grammar school; it would be another big mistake to raze it. After closings and cuts around the city, the mayor finds $18 million for an affluent neighborhood school.